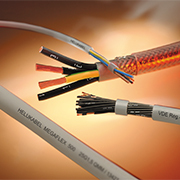 HELUKABEL now supplies pre-assembled data cables for Industrial Ethernet systems. With molded M12 and RJ45 industrial connectors, customers can modularly assemble any possible combination of cables and connectors to “design” a product built exactly for their needs. As a system provider of cables, wires and accessories, HELUKABEL is able to offer customers an extensive range of cables to choose from. In combination with high speed data cables with transmission rates of up to 10 GBit/s, the molded M12 and RJ45 connectors guarantee a faster and more reliable connection within control cabinets, machinery and in-the-field operations. 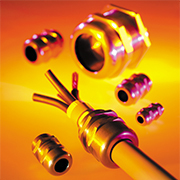 The cable/connector combinations are directly related to the customer’s intended application use – static, occasional movement, or continuous-flex. 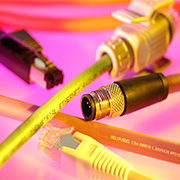 HELUKABEL’s molded M12 connectors come in D- and X-coded versions, both male and female, for use with Category 5 and 6A cables, which cover higher data transmission rates of up to 10 GBit/s. Due to their metal casing, both the connector and socket are extremely robust and are resistant to dirt and moisture when connected, in accordance with IP-67 certification. The sturdy design of the RJ45 connector makes it particularly suitable for industrial applications. It supports data rates up to 10 GBit/s and has a maximum bandwidth of 500 MHz. The connector is available in a linear or angled version, thus making it suitable for use in industrial areas where space is limited. Both the molded RJ45 and M12 plug-and-play solutions are UL/CSA approved, making these products suitable for use in machinery and equipment in North America, and anywhere in the world where UL and CSA are recognized. For more information please visit helukabel.com/RJ45M12Overmold. HELUKABEL USA, Inc. is the wholly owned U.S. subsidiary of HELUKABEL GmbH, a leading international manufacturer of cables and wires with 28 locations throughout the world. In its 45,000-square-foot, suburban-Chicago facility HELUKABEL USA stocks over 4,000 cables, wires and accessory line items for a multitude of industrial and commercial applications across a wide range of vertical market segments. Direct access to a 1.72 million-square-foot, fully automated warehouse with 33,000 line items, enables HELUKABEL USA to provide extremely short delivery times. 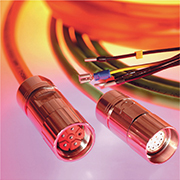 HELUKABEL's Cable, Wire & Accessories catalog with 33,000+ line items, cable selection tables, technical information, and much more! 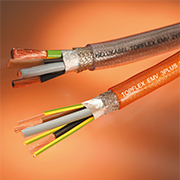 Learn about the differences between in copper and aluminum, why aluminum can be a smarter cable option, and how to handle the aluminum cables and connectors.